One man claims that he had caught a video of the holy being flying into view and leaving seconds later. 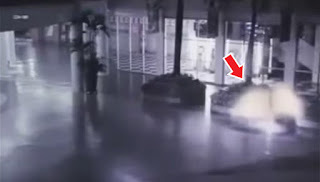 According to reports, the video is a security video taken at the Cilandak Town Square in Jakarta Indonesia. A screenshot from the CCTV footage of the building. In it, you could spot a winged light being descending down and then flying away moments later. After it disappeared, you could see a group of people jogging towards the spot the alleged angel supposedly descended and checking it out for clues maybe of what it was. Art had often depicted angels with bird-like wings on their back, a halo, robes and various forms of glowing light. And in the video, you could see just that. However, some commenters said that the video is a hoax, while others said it may be an extraterrestrial or a humanoid instead. What do you think? Could the video be a legit video of an actual angel?